Noctum is a new fresh young band from Sweden with already one album, The Séance, on their list. Now they follow up with a small EP with 3 songs to keep them in close circulation on the doom scene. 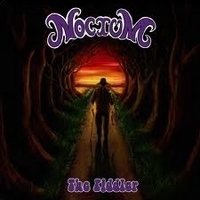 This album is not bad at all, but they have chosen a style that could be a little out of date, the sound, the acid-sound, of early Judas Priest and Black Sabbath in unison to be played in 2011 by the Swedish promising band Noctum. What a mix, but it works out okay. The title song The Fiddler is both the acid driven Black Sabbath tones combined with some heavy riffs and heavy tempo to save it from drowning completely, a song above middle quality. The Serpent Bride again nods in the direction of Black Sabbath, plain doom metal but not ringing the bells of perfection, but okay anyway. Last song is Lazy Lady, a cover version of Pentagram's old song. Good simple heavy metal that fit in most metalheads CD collection. This sounds like an interesting future for the Swedish band Noctum for years to come.